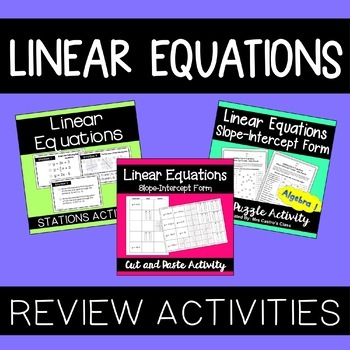 Get students moving around the room and working together to graph and write linear equations with these 8 Station Cards. Includes a student recording sheet and teacher answer key. - Writing an equation of a line parallel or perpendicular to another line. In this activity, students match Linear Equations with the graphs and tables that represent them. Students must have knowledge about slope-intercept form and how the equations relate to tables and graphs. This worksheet is a fun way for your students to practice writing linear equations in slope-intercept form! Students are given a point and slope, an equation in standard form, or two points, in order to write the equation in slop-intercept form. They match the equations to reveal the answer to a riddle, so students will know right away if they've done it correctly! The file contains the student worksheet and teacher answer key.